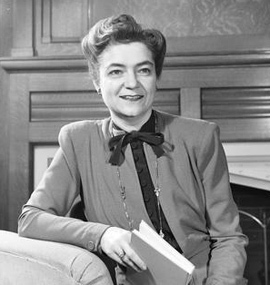 Kate Hevner Mueller served Indiana University from 1937-1969 as Dean of Women, Senior Counselor for Women and Professor of Education. Dr. Mueller was a national pioneer for women professionals and developed the Master’s Program in College Student Personnel (Higher Education and Student Affairs) at Indiana University in the early 1950s. Dr. Mueller’s believed a university should promote the intellect, develop the personality, and teach citizenship as well as leadership to all students. Her publications span the disciplines of psychology, music, and student personnel. Her two seminal works continue to be cited today: Educating Women for a Changing World and Student Personnel Work in Higher Education. The Kate Hevner Mueller Senior Awards were established in 2013 to honor IU seniors who have proven leadership on campus both inside and outside of the classroom and who have improved the IU community by their presence. Each year, a limited number of students receive a Kate Hevner Mueller Outstanding Senior Awards. Complete the online application The application requires that you upload a current resume, 3 letters of recommendation (which can also be sent directly by the recommenders to srawards@indiana.edu, and a short essay responses (no more than 700 words) on the topic below.